Our bunso (our youngest of 4) posted in her facebook and instagram accounts that she likes our sibling #3's adobo best, my mami's 2nd, and mine last. When it comes to cooking specially with my siblings, I usually tend to be competitive. I want my dishes to be appreciated and loved by all :-) But then instead of arguing with my sister about her basis of comparison, nor pointing out that her taste buds are under-developed and unsophisticated that she cannot discriminate among good, better, best or the opposite (I used to do that hehehe), I realized that she too has her own preferences and criteria of what is good and bad as to what makes a great adobo. To each her own. Similarly, everyone has their own best adobo recipe. I've tasted some of my sibling #3's adobo recipe and I can say that they were not bad. I do like them actually as they were tasty. My husband even said one dinner time at my sister #3's house that he liked her chicken adobo better than mine because hers was saucy (I cooked mine dry most of the time). I didn't talk to him the whole meal after that hahaha. 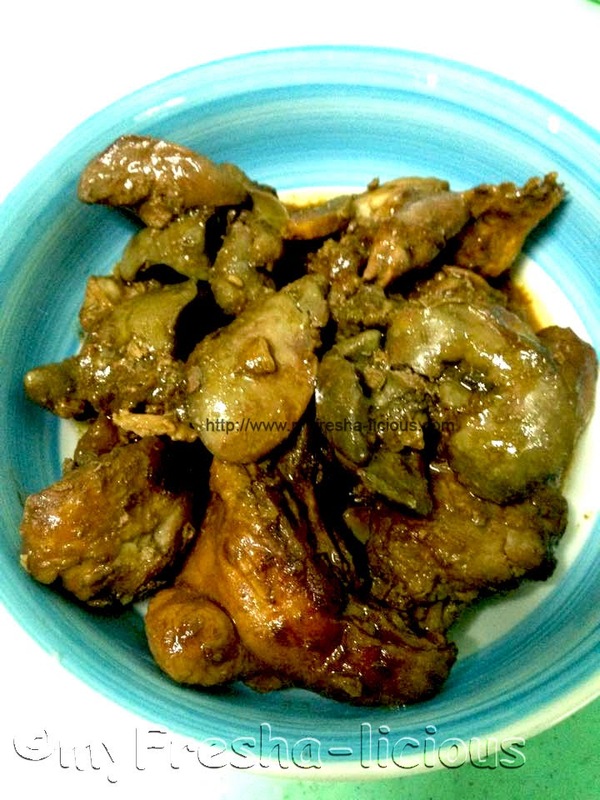 Here is just one of my sibling #3's adobo recipe - Check our collections of adobo recipes here. 1. Saute garlic, ginger, and onions together until aromatic. 2. Throw in the chicken and stir for a few minutes. 4. Add in the liver, add a little water if needed just enough to cook the liver. 5. Throw in the sugar, maggie magic sarap, and black peppercorn. Simmer.